Looking for a netbook case with a little Geek Chic flavor? 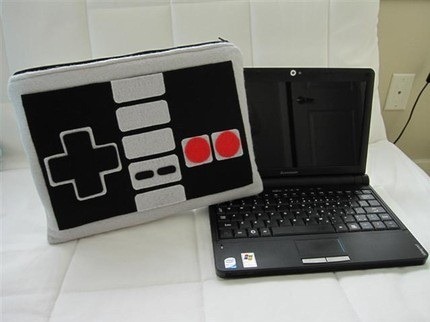 Check out the awesome handmade NES controller pouch Netbook.ie discovered. The cases are made by a seller , and they’re 8 bits of old-school gaming goodness. At €60, it’s a steal of a deal for a unique, hand-crafted portable pouch. Now, I wouldn’t recommend using this as the only case you cart your netbook around in. It’s made of felted material, after all, not ballistic nylon. Still, I can’t think of a carrying case I’ve seen that would make your geeky friends at work drool more than this little baby. Better hurry if you want one – I imagine there will be a rush of orders as netbookers find out about the NES case.